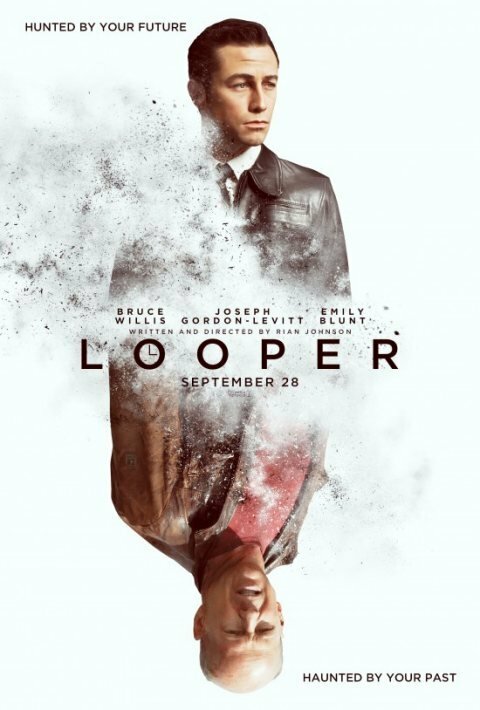 We've already gotten a quick glimpse at the transformation Joseph Gordon-Levitt is undergoing to star in Looper, the new sci-fi film from The Brothers Bloom director Rian Johnson in which he plays a younger version of Bruce Willis. It's hard to tell exactly what they've done to Levitt to transform him, but he certainly isn't looking like himself, and that effect is magnified even more in the first poster for the film, which debuted today at Slashfilm. Take a look at it below or see it there in higher res. The whole mirror image thing happening vertically makes the poster immediately distinct from all the garbage floating heads we usually see, and I love the effect of both actors disintegrating, either by explosion or the passing of time. You also notice, of course, that Levitt is wearing blue contacts, necessary to make him look like Bruce Willis but also seriously disorienting-- it's a small change but enough to make him look like an entirely different person. Looper remains fairly mysterious, and that's exactly how we want it right now. The teaser trailer will be released next Thursday, April 12, and will presumably give us a better sense of the film's time travel plot and what exactly happens when Levitt's hitman character is assigned to kill his own future self. In the meantime, though, we'll just keep enjoying the mystery. Looper opens in theaters September 28.